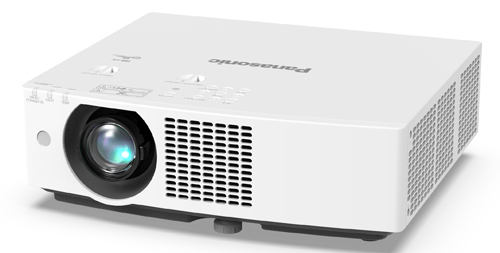 Coinciding with the ISE show in Europe this week, Panasonic has introduced the new PT-VMZ50 series of projectors said to be the world's smallest and lightest WUXGA laser models in the 5,000 lumen or higher class. Three 3LCD models covering different light outputs and resolutions all share the same compact chassis that measures in at approximately 16 x 5 x 14 inches (WHD), and they each weigh just under 16 pounds to facilitate easy transport among different locations. Models PT-VMZ50 and PT-VM-Z40 are WUXGA resolution (1920x1280) at 5,000 and 4,500 lumens, respectively, while the PT-VMW50 is a 5,000 lumen, WXGA (1280x800) model. The series uses a To provide versatility, all three can accept 4K-resolution signals (up to 30 frames-per-second) and display them at the projector's native resolution. To simplify set up in the corporate and educational environments the series is targeted at, the projectors are provided with a 1.6x zoom with a short 1:09:1 throw ratio that facilitates close placement to the screen. Wide-range lens shift spec'd at +44% vertical and +/-20% horizontal allows for even more flexibility. Panasonic's Solid Shine laser light source used in all three models is rated for 20,000 hours of life to half-brightness. Numerous connection options include integrated HDBase-T for transmitting signals over Cat5e or higher Ethernet cable (up to 492 feet for Full HD/1080p or 164 feet for 4K), and an optional wireless module that allows sharing from personal devices of audience members. A built-in USB media player allows the viewing of content from a flash drive without the need for a computer. Other convenience features include a built-in 10-watt speaker for audio, and a Quick Start/Quick Off feature that can take the already fast laser response time down to just one second from Standby condition to allow instant-on presentations. The PT-VMZ50 series will be available in March. MSRP/Street prices are as follows: PT-VMZ50, $4,499/$2,499; PT-VMZ40, $3,999/$2,199; PT-VMW50, $3,199/$1,799.